Worcester County is home to over 60 Biotech companies. The Biomanufacturing Training and Education Center at WPI provides a trained workforce. 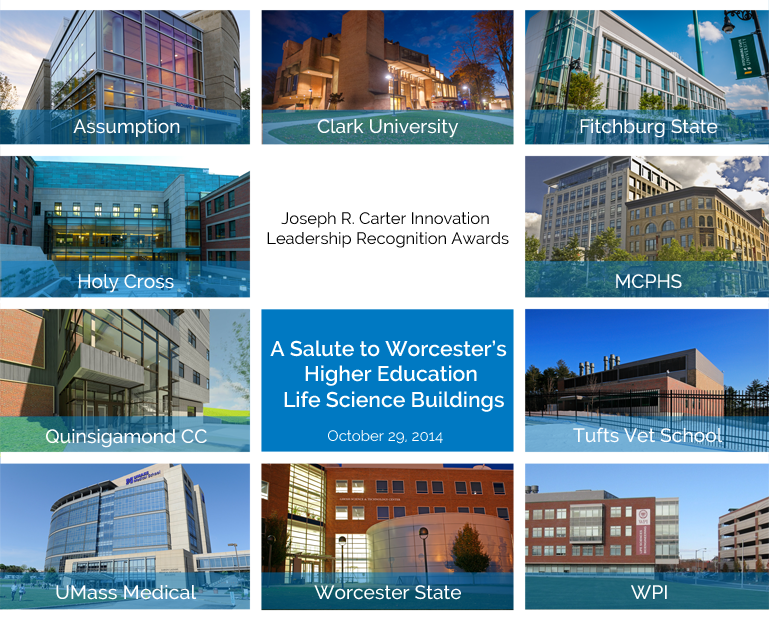 Worcester has twelve colleges and universities² with over ten new science buildings and 35,000 college students. According to Bankrate.com, the cost of living in Worcester is 22% less than Boston or Cambridge. This savings allows startup companies to direct more investment towards talent and science instead of real estate. MBI’s is one of the most affordable alternatives in the state and MBI rent includes additional services focused on promoting our tenant companies success. Office and lab rents in Worcester are on average less than half of rents in Kendall Square and Boston. 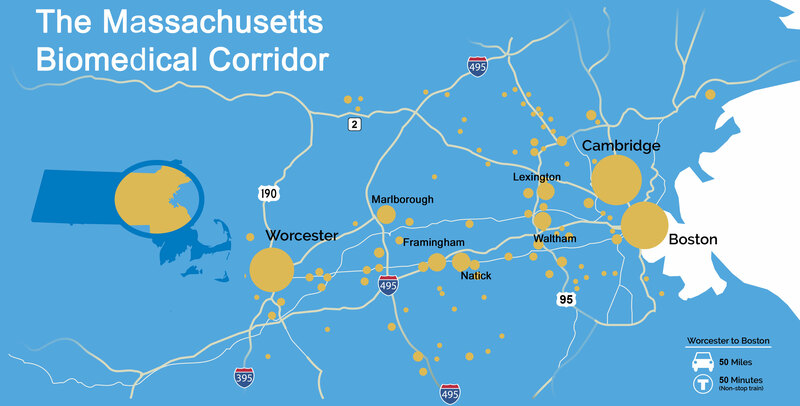 Worcester has excellent access to all of New England through I-90, I-290, I-190, Rt. 146, and I-84. 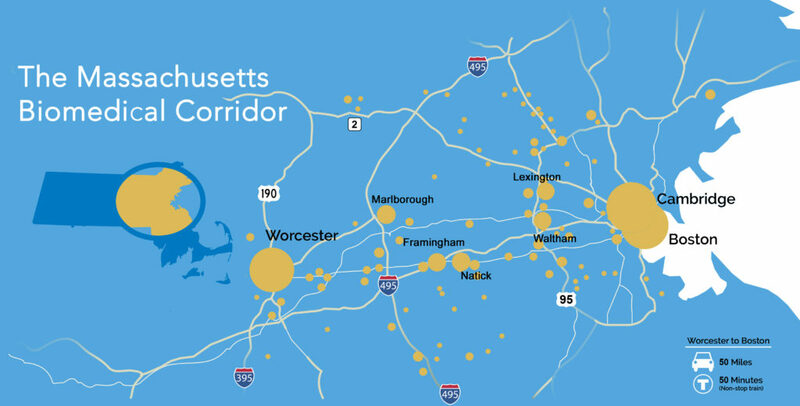 Worcester has 20 round trip Commuter Rail trains to Boston daily and has easy access to freight rail through the CSX Intermodal Yard and the Port of Worcester. Worcester Regional Airport provides air service to the City. Worcester is home to world class restaurants and cultural attractions including the Worcester Art Museum, Hanover Theatre for the Performing Arts,DCU Center and Convention Center, Tuckerman Hall, Mechanics Hall, Palladium, and some of the best live music around. Worcester’s Shrewsbury Street hosts some world class restaurants at a fraction of the price of Boston’s best. For more information on Worcester’s restaurant scene, check out: tasteworcester.com, or visit the annual Taste of Shrewsbury Street event!